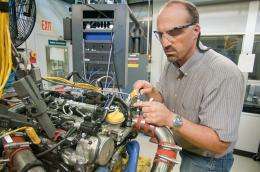 (PhysOrg.com) -- Diesel engines, long confined to trucks and ships, are garnering more interest for their fuel efficiency and reduced carbon dioxide emissions, relative to gasoline engines. Argonne mechanical engineer Steve Ciatti takes a crack at some of the more persistent myths surrounding the technology. "We all have this image of trucks belching out dirty black smoke," Ciatti said. This smoke is particulate matter from diesel exhaust: soot and small amounts of other chemicals produced by the engine. But EPA emissions requirements have significantly tightened, and diesel engines now have to meet the same criteria as gasoline engines. They do this by adding a Diesel Particulate Filter (DPF), which removes visible smoke. "DPFs are very effective," Ciatti said. "They remove 95-plus percent of the mass of smoke." The smoke, trapped in a ceramic matrix, accumulates until the car's computer determines it's time to clean it out in a process called a "regeneration cycle." "Visible smoke is essentially gone, as of the 2007-2010 regulations," Ciatti said. "If you're buying a diesel car from 2007 or later, it's no dirtier than a gasoline-powered vehicle." And in the invisible range -- diesel engines actually emit less carbon dioxide than gasoline engines do. Myth #2: Diesel engines won't start in the winter. "Today's technologies for cold-start are very effective," Ciatti said. "Modern diesel engines start in cold weather with very little effort." The problem is that diesel jells at low temperatures. Below about 40°F, certain hydrocarbons in diesel turn gelatinous. "Since an engine depends on aerosolizing fuel, you don't want goopy fuel," Ciatti explained. Low temperatures aren't a problem for gasoline engines because gasoline is much more flammable than diesel. Even at room temperature and pressure, gasoline is partly vapor. "Toss a match into a pool of gasoline, and the match will never even hit the surface of the liquid; it will ignite the layer of vapor above the pool," Ciatti said. "That's why gasoline has to be handled extremely carefully around any ignition source. Diesel isn't so volatile; if you tossed that match into a pool of diesel, it would go out." Myth #3: Diesel cars don't perform well. Because diesel engines are still most common in trucks, many people assume that diesel-powered cars would behave like a truck behaves: slow and sluggish. "But keep in mind, that truck's likely hauling around 50 tons," Ciatti said. "In fact, to some degree, some people who drive diesels find they perform better than gasoline engines." That's because diesel-powered engines get their best power when the engine's revolutions per minute (RPM) are low -- that is, at speeds below 65 miles per hour, where most driving takes place. Gasoline engines, in contrast, get to peak power by running the engine very high and fast; a gasoline car only reaches its peak horsepower with the accelerator pedal to the floor and the engine running at 5,000 RPM. "Diesel car performance is far better than the perceived horsepower rating, because you're getting all that power at speeds where you actually drive the vehicle," Ciatti said. "You've got more pulling power and more acceleration at those speeds." Myth #4: You can't find diesel at the pump. "I drove a diesel car myself for 10 years. I can count on one hand the number of times I had to actually search for a pump," Ciatti said. "Diesel fuel is not more expensive to produce than gasoline," Ciatti explained. "Its price usually has to do with the local tax structure." Why? Gasoline engines operate at a very specific ratio of fuel and air. At high altitudes, the air is thinner--literally: there are fewer molecules of air per cubic foot. In the mountains, then, gasoline engines have to add less fuel to keep the ratio perfect, which affects performance. "But a diesel engine runs fuel-lean; you don't have to keep the ratio perfect," Ciatti said. Diesel engines have turbochargers, which are pumps driven by exhaust gas. They add more air to the combustion chamber, and more air means more fuel can be added. At altitude, it can pull in more air and more fuel, and thus gets more power than gasoline engines can. Turbochargers don't use extra energy; they run off thermodynamically "free" energy that would be lost as exhaust if not used. "Drive a diesel at altitude and you'll see other cars struggling while you zip past," Ciatti said. "The effect is very noticeable." EarthTalk: Why doesn't U.S. have high-mileage diesel cars, like Europe? Full torque at idle more than makes up for slightly lower maximum horsepower. When I first purchased the van, I had problems with wheel spin when accelerating from a stop sign. I've never experienced a lack of power, regardless of the speed. And my van is quiet. I've had people at service stations try to wave me away from the diesel pumps, because they couldn't believe a quiet engine could be a diesel. My 2004 diesel van delivers 26-29 mpg, which more than makes up for the higher price of diesel in Oregon. Oregon has no refineries, so all of our fuels are more expensive. So what is news about anything here? What is the purpose of reviewing same-o same-o? Compression ignition engines are somewhat more efficient, significantly more expensive due to the high cost of the exhaust after-treatment (but still less so than hybrid battery technology). Fuel is generally more expensive due for the most part to government meddling (taxation). "In fact, to some degree, some people who drive diesels find they perform better than gasoline engines." Yeah, maybe "some people" to "some degree", because most drivers prefer to avoid that Diesel creeping noise and vibrations, and acceleration is better using a gasoline engine of the same price, at ALL speeds, it is just a question of using the right gear when you need it. Also gasoline engines, they have turbo or high pressure injectors, this is not a competitive advantage at all. The biggest problem with diesels is particulate emissions, which the article conveniently ignores in point #1, and which are a significant health hazard. Early diesel trucks used engines with the 2 cycle combustion process and they smoked under load and today diesel locomotives still use the 2 cycle engine and they smoke and give the modern 4 cycle diesel engine a bad reputation. The glow plug is only used in low compression diesel engines to provide a hot spot to ignight the feul. In cold temperatures the vehicle is kept in a heated shed so the feul will not jell and when outside the engine is kept running so the feul used to cool the injectors is recirculated to the feul tank to keep it warm. The problem of regular diesel fuel is that it contains waxes that precipitate out and block the fuel system below the cloud point temperature for the fuel, so even if you can get the vehicle started it won't run for very long, and you're in for a fuel filter change. Trucks use heated fuel systems, and there are special arctic blends that can work down to -40 F, but they're more expensive, and they're harder on the fuel pumps and injection systems because they are closer to jet fuel than diesel. In the old times you'd mix some gasoline in the diesel and add a dash of two-stroke oil to keep the injection pumps lubricated if you couldn't get the arctic blend, but with modern high pressure pumps it's a bit more risky. if you tossed that match into a pool of diesel, it would go out." Not really. Toss a burning match on diesel-soaked pavement and the match will act like the wick of an oil lamp, creating a burning puddle of diesel once it heats up enough. "...do you wanna ride in my Mercedes, boy?" I do I do! Living in europe, and I even own a diesel, these "myths" are not at all familiar. An American's view of diesel engines. How sad! Here in Europe I'd say about 30% of the cars have diesel engines. The common view is that diesel engines are more expensive, but you spend less on fuel because they're more efficient and fuel is a bit cheaper. "Diesel engines actually perform better at high altitudes than gasoline engines." ?! The author is aware that he is comparing a Turbocharged diesel with a atmospheric petrol engine, isn't he! ?